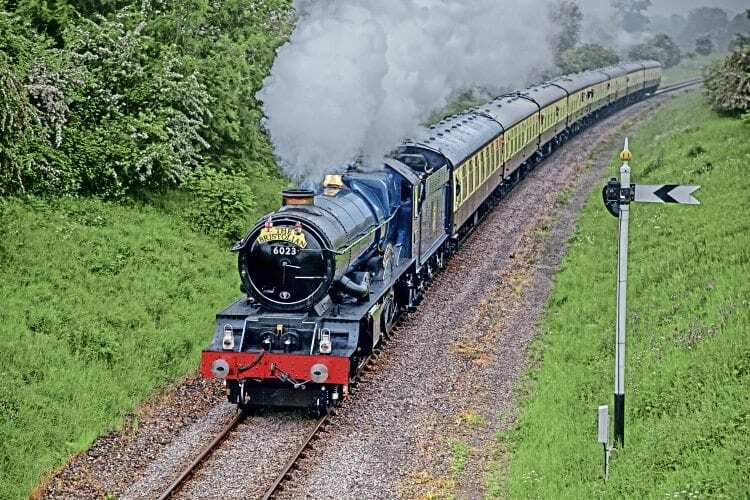 THERE was a certain historic irony to a Great Western ‘King’ sharing the spotlight with a locomotive named after Oliver Cromwell at the Gloucestershire Warwickshire Steam Railway’s (GWSR) gala on May 26-28 – an event which has smashed many records for the heritage line. The high-profile ‘Royal’ No. 6023 King Edward II and ‘Roundhead’ No. 70013 were just two of the four visiting locos at the GWSR’s Cotswold Festival of Steam, together with ‘S160’ 2-8-0 No. 5197 and Llangollen-based ‘64XX’ 0-6-0PT No. 6430. The ‘King’, ‘Britannia’ and pannier had previously been together at last September’s Old Oak Common open day, along with GWSR resident ‘Modified Hall’ No. 7903 Foremarke Hall, which was also in action during the gala. Completing the line-up were home-based ‘Manor’ No. 7820 Dinmore Manor, ‘28XX’ 2-8-0 No. 2807, and ‘Merchant Navy’ No. 35006 Peninsular & Oriental S. N. Co. All took turns on a varied timetable, which featured both top-and-tail and double-headed workings, with Toddington being a hive of activity.